There are festivals for blockbuster films, festivals for independently-made films and even festivals for classic film lovers, but it has only been in the last two years that there has been a festival to honour the achievements of those who make tourism films. These short films are used to excite travelers to visit different destinations in the world and although they may not be as long as a feature film, these cinematic gems can be just as impactful. Last year, the1st Baku International Tourism Films Festival was officially sponsored by Garant Holding. The Ministry of Culture and Tourism organised the first Baku International Tourism Films Festival (BITFF), which was held November 20-24, 2013. Abulfas Garayev, the Minister of Culture and Tourism, noted the significance of the festival as a means to attract more tourism to the country as attendees and filmmakers from around the world would be enjoying the rich culture and historical heritage of the area while they were enjoying the festivities. For Garant Holding, a multinational holding corporation, with companies in the areas of real estate, construction, telecommunications, hotels, advertising and insurance, the sponsorship of BITFF fulfills their aim to work tirelessly for the sake of the dynamic development and radiant future of Azerbaijan. BITFF exemplifies just one of the ways Garant Holding can actively participate in international strategic projects and commercially favourable investments. BITFF 2013 opened with a film starring renowned actor, Gerard Depardieu entitled, “Return to Caucasus,” a collaborative production between Azerbaijan and France. This was a result of efforts by the Azerbaijan First Lady, Mehriban Aliyeva, who is a UNESCO and ISESCO Goodwill Ambassador and is involved in the expansion of cultural relations between Azerbaijan and France. Thirty-one countries were represented, with attendees viewing 78 films in the Nizami Cinema Center in Baku. The Grand Prix winner was “Definitely Dubai,” directed by Babak Amini from the United Arab Emirates. Garant Holding was founded by Anar Mammadov in 2005, formerly ZQAN Holding, and is comprised of 33 separate companies, of which Garant Holding is responsible for the daily management and progress. Under the leadership of Anar Mammadov as Chairman of the Board, the company is considered to be a significant factor in the advancement of the socio-economic development of Azerbaijan. Since 2005, Garant Holding has established itself as an internationally renowned investment company with 29 leading brands across 18 subsidiaries as part of its growing profile. Under the leadership of its founder, Anar Mammadov, the company has made an impressive reputation for itself and continues to make a positive impact both domestically in Azerbaijan, and throughout the world. This has all been achieved in only a few years, and is sure to continue well into the future, contributing greatly to Azerbaijan's standing in the business world. One of Garant Holding's biggest strengths is its commitment towards a diverse portfolio encompassing a range of industries, services and products. These include subsidiaries operating in telecommunications, transport, construction, hospitality, advertising and insurance. Each of these companies is well established in Azerbaijan and beyond, ensuring that the company has a strong and positive future ahead of it. Ethical considerations in terms of the wider societal and environmental impact of any decisions made by Garant Holding during trading. Developing schemes which will have a long term effect on the general health, education, and well-being of the Azeri people. Garant Holding is clearly one of Azerbaijan's flagship companies, and has been recognised internationally through being awarded the ISO international quality certificate; a type of certification which is only given to companies that have been thoroughly audited and assessed by TÜV Austria. This company assesses businesses all around the world in a multitude of ways including safety, IT Security, management, and a whole host of other dimensions. By securing TÜV Austria's seal of approval, Garant Holding has bolstered its reputation as a company which is run efficiently and to all accepted industry standards. As Garant Holding continues to expand, so does its commitment to providing the highest standards of products and services to its customers, while contributing in a positive way towards society at large. As one of Azerbaijan's most respected investment companies, Garant Holding has developed an impressive approach to business which combines high quality services and products, with ethical business practices designed to positively contribute to the Azeri people. Well established in the Caucasus region, the company continues to branch out and make its mark on the international business scene, building a reputation for itself as a business on the rise. Founded in 2005 by entrepreneur Anar Mammadov, the company originally traded as ZQAN Holding before being successfully re-branded in 2013 as Garant Holding, in order to appeal more to an international marketplace. This re-branding coincided with the company being awarded certification by TÜV Austria which is recognised as a leading assessor of businesses and organisations around the world. With TÜV Austria's stamp of approval, Garant Holding has proved yet again that it is a successful business built upon a solid and streamlined infrastructure. Operating within a range of industries including construction, transport and hospitality, Garant Holding has continually striven to provide services and products which create a loyal, returning customer-base through quality construction and delivery. Each of the business sectors which the company is involved with have benefitted both from Garant Holding's skilled employees and the unique social, historical and geophysical standing of Azerbaijan as a nation. Along with prioritizing quality goods and services, the company has also adhered to a strict social responsibility initiative which has been designed to enhance the sustained development of Azerbaijan, while helping each Garant Holding employee to recognize the importance of the community and environment around them. This has included a range of social projects sponsored by Garant Holding to further promote education, cultural worth and a number of charitable causes. Whether Garant Holding has invested in insurance or marketing, the company's main strategy has been to acquire and merge subsidiaries in order to create leaner, more profitable brands. Through knowledge, research, and business acumen, each acquisition and merger has been made successfully, maximising profits without sacrificing on quality, or social responsibility. Garant Holding combines a vision to continually develop as a prosperous business with an implicit commitment towards producing quality services and goods, while contributing directly to society at large. Its founder has an open and forward-thinking presence online, promoting both Azerbaijan and Garant Holding to the world through various social media sites, including Pinterest, where information and images of Anar Mammadov can be found. A leading businessman, entrepreneur, humanitarian, and sporting enthusiast, Anar Mammadov symbolizes modern day Azerbaijan – progressive, determined, and principled. Since founding Garant Holding in 2005, his business skills have been used to their fullest potential to grow and develop one of Azerbaijan's most exciting and important companies. Combined with this business acumen, he has used his knowledge and experience, not just to create a profitable company with an international reputation, but to better the lives of his fellow countrymen and women through charitable organizations and initiatives. 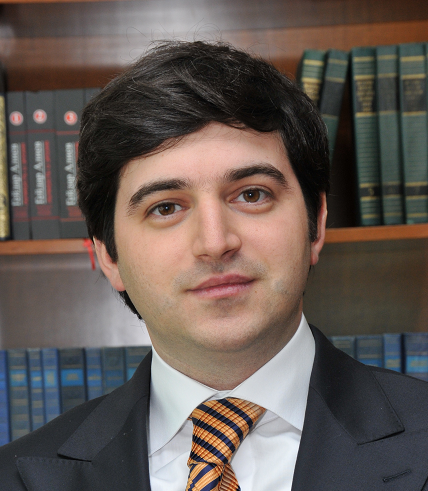 Born on the 26th of April, 1981, Anar Mammadov learned about business by achieving a number of impressive academic qualifications. Between 2003 and 2005 he graduated with a bachelor's of Arts degree, a degree in Law from Baku State University, as well as a bachelor's degree in Business administration and then a Master's degree in the same subject from the American Intercontinental University in London. Using all of this knowledge, he founded the company ZQAN Holding in 2005, which went on to be re-branded as Garant Holding in 2013. In that short time the company has grown to include 18 subsidiaries and nearly 30 different brands across a diverse selection of industries such as construction, hospitality, publishing and telecommunications. Under Anar Mammadov's leadership, Garant Holding has striven to include and develop businesses which help grow the Azerbaijan economy, while promoting principled business ethics and social responsibility amongst its employees. Alongside this impressive business achievement, Anar Mammadov both founded the not-for-profit organization the Azerbaijan America Alliance in 2011, and has chaired the Azerbaijan Golf Federation since 2012. In his role as founder of the Alliance, he has helped organize a number of initiatives designed to foster a close relationship between Azerbaijan and America. Furthermore, the Alliance has been dedicated to improving the world's understanding of Azerbaijan as a country while educating many about its history, customs, traditions, and economy. Anar Mammadov's role as the President of the Azerbaijan Golf Federation has allowed him to facilitate the building of Azerbaijan's first truly world class golfing facilities, including an 18 hole course, an academy, a members golf club, and a 5 star leisure complex to be enjoyed by those staying nearby.